Welcome to your guide to iOS® 11 app development. 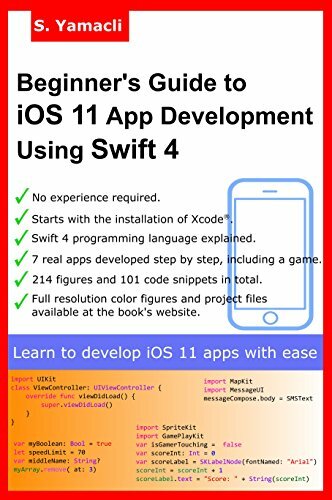 This compact book aims to teach app development for iOS devices using Swift™ programming language. You don‟t need to have app development experience to learn the concepts and projects presented in this book. I‟ll assume that you have no knowledge on programming and app development. I‟ll try to explain every bit of app development process with plain words and will try to make things easy to understand. This book will take you as a beginner and at the end of the book; you‟ll be able to create your very own apps that are ready to run on actual devices and also ready to be sold at the App Store®. By the way, I‟d like to remind you that a single book cannot make you an expert on a subject. However, this book will teach you a lot and you‟ll have a solid background to learn more afterwards. As you might have heard, iOS apps have been developed using a programming language called Objective-C® for a long time. However, Apple recently introduced a new programming language: Swift. They announced Swift in the World Wide Developer Conference (WWDC) in 2014. In that year, first version of Swift was released. After some important modifications, Swift 2 and Swift 3 came around and finally Swift 4 is released in September 2017. Swift was a proprietary project in the beginning but now it is open source and a lot of developers contribute to this promising language. Swift has a more active community compared to Objective-C by September 2017 therefore your investment on learning Swift is a good choice. 5. Utilizing internal devices like GPS in your own apps I‟ll not introduce complicated subjects until I‟m sure that you understand the basics because it is very easy to get lost while learning a new programming language. You‟ll not be in such a situation with this book. I‟ll try to teach new concepts in the simplest way possible. Please don‟t forget that learning a programming language is a non-stop process, it never ends and this book will help you to get started easily. Now, you know the aims and the method of this book. Let‟s set up Xcode 9 integrated development environment on our Mac®. By the way it is worth noting that the development environment we will use can only be installed on a Mac.